We are a young couple who decided to make a drastic life change with the hope of living a more fulfilling dream life. In 2013, we decided we were unhappy with the trajectory of our lives. We were married with a house and stable jobs. We were traveling on a fairly regular basis to some pretty fun places. We were also living paycheck to paycheck and only truly felt alive during our three and four weeks of vacation. In October 2014, we decided to make a change in our lives. 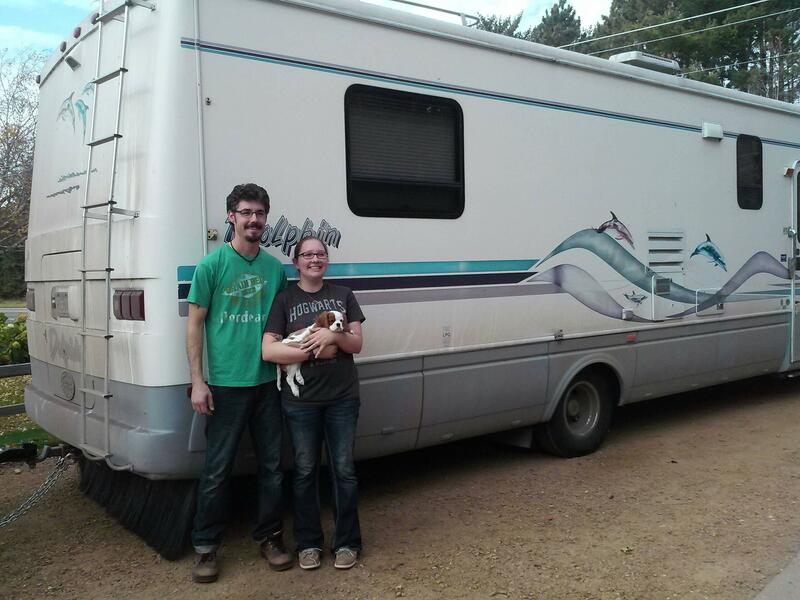 We decided that we were going to sell our house in St. Paul, Minnesota, buy an RV, and save up some money to travel for a while. We also decided to quit our jobs working for major corporations, jobs that did not really make us happy or inspire us. We grew tired of being corporate drones, just a number in the masses. We were determined to live lives that meant something to us on a daily basis, lives that revolved around us being happy for a majority of the time instead of just occasionally. We took “you only live once” to heart and ran with it. A year later, we were able to sell our home, buy an RV, save up money over the summer, quit our jobs, and head out on the open road. We are incredibly excited to see where life will take us and to explore the United States (and perhaps Canada). We are excited to find out who we are outside of working 50 hours a week. We are excited to find our hobbies again and hopefully be able to make some sort of a living off of them. Mostly, we are excited that we get to experience this amazing adventure together, with each other and our furry, feathered, and scaled family members. We traveled through South Dakota, Iowa, Missouri, Arkansas, Oklahoma, Colorado, New Mexico, and Arizona before settling in Southern California for a while as park hosts. After leaving SoCal, we traveled up the state of California, into Oregon, Washington, Idaho, Montana, and North Dakota. We hope you enjoy reading about our adventure! Have fun! Andy’s not deer hunting this year? No sir! We had to leave before the weather got to cold to live in the RV so we won’t be in the state for deer hunting:/ hopefully my dad can get us some venison! A beautiful area of the West is, The Petrified Forrest and Painted Desert in Arizona. Pikes Peak and Golden Colorado. Alma Gordo and White Sands in New Mexico. Don’t miss the Air Force Academy in Colorado – the Chapel is amazing & the history of our Western States is fantastic. Oops!!!! I forgot to say, make sure you go to the Hoover Dam and Lake Mead in Nevada. Have a terrific and safe time with your travels. Saw an article in MotorHome about your journey. I think you both have a great sense of priorities. It took us about one year in our first RV (an Itasca Navion) to realize retirement was not going to wait until we were 60 something. Like you the good part is we will get to bring our dogs. The tricky part for us is two are pit bulls (the last being a Chihuahua – and that’s the one with the attitude – trust). For that reason we plan on doing a lot of public land boon docking as apposed to RV Park camping although we hope to find some places that will accept us along the way. There is still plenty to see and enjoy in the great open places and I look forward to enjoying the dogs discover it with us. Best of luck and appreciate the tip on vacuums. I think we’re going to need a good one with some chutzpah. We always love hearing from other RVers who travel with their dogs! It can be hard to find places to accept dogs so boon docking is a good idea. We wish you luck on your travels and thank you for reaching out! Thank you for reading and reaching out! The insurance question has been a tough one. We tried a couple of options but ultimately found that we cannot afford insurance at this time. We have paid out-of-pocket for our medical needs (not ideal) and have a savings for catastrophic situations. It’s not the best situation but it will have to do for now. We are hoping to find a better solution in the coming months. The penalty for not having insurance is far less than what we would pay to have it but we understand that we are gambling a bit at the moment, hoping that nothing big happens until we can figure it out.